Leslie Edwin Miles was born on 10 November 1953, in Elyria, Ohio USA, to parents Martha and Bubba Miles. He is an American Football coach and former football player, currently coaching at Louisiana State University. 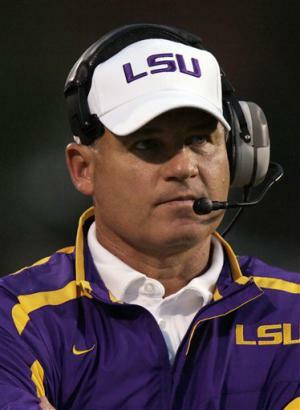 A famous coach, how rich is Les Miles? According to sources, Miles has accumulated a net worth of over $12 million, as reported in mid-2016. His wealth has been earned during his long coaching career. Miles attended Elyria High School in Ohio, earning all-state honors in football as well as letters in baseball and wrestling. Upon matriculating in 1972 he enrolled at the University of Michigan, where he was a two-year letterman on the college football team, the Michigan Wolverines, under coach Bo Schembechler, playing in two Big 10 Championship Teams and being part of the 1976 Orange Bowl. He graduated in 1976 with a degree in economics. In 1980 Miles came back to the university to work as Schembechler’s assistant coach. Two years later he became offensive line coach at the University of Colorado, sending two teams to bowl games. In 1987 Miles returned to the Michigan Wolverines as offensive line coach, and the team enjoyed eight consecutive winning seasons as well as appearances in bowl games. In 1995 Miles became offensive coordinator for the Oklahoma State Cowboys and two years later he moved again to work as tight ends coach for the NFL’s Dallas Cowboys for three seasons. In 2001 he returned to Oklahoma State University as the team’s head coach; during his first season, the team posted a losing record, however, that changed during Miles’ following seasons when the team had winning records during all three seasons under Miles, who was then named the Big 12 Conference Coach of the Year by the Associated Press. Coaching a number of teams has greatly contributed to his net worth. In 2005 Miles became the head coach of Louisiana State University team the LSU Tigers, just a few days after the Hurricane Katrina hit south Louisiana. However, despite the trauma left by the hurricane, Miles succeeded in leading the team to win the 2005 SEC Western Division Title. During his second, 2006 season, Louisiana State team didn’t win a division or conference championship, however, they had an 11-2 record, not to forget a spectacular victory over Notre Dame in the Sugar Bowl. In 2007 the LSU Tigers won the SEC title and the BCS National Championship game against Ohio State – this was their best season, but 2008 the worst. Things improved during the following 2009 and 2010 seasons, and in 2011 the team really got back on track, going 13-0 for the first time in school history, with Miles earning the 2011 Associated Press College Football Coach of the Year Award, the former LSU coach Saban being the only one to receive the award before Miles. Miles enjoyed the fame as well as a considerable wealth. However, the team lost in the 2012 BCS National Championship Game over Alabama 21-0, and a lot of blame went to Miles due to his benching of a leading quarterback. Since then, the team’s annual SEC records have been 6-2 in 2012, 5-3 in 2013, 4-4 in 2014 and 9-3 in 2015. Miles has been the Tigers coach for 11 years now, and has been ahead of the team’s previous coaches in several aspects: he has had seven 10-win seasons during his 11 years with the Tigers; the team has won two SEC Championships under Miles and his winning percentage has been 77.5, the best of any Tigers coach. Miles’ 11-year tenure with the Tigers has earned him an appreciable fortune. There has been repeated speculation of Miles becoming the head coach for the University of Michigan. However, Miles has denied the news several times, stating that he will remain at LSU. When it comes to his personal life, Miles married Kathy Miles in 1993, and they have four children.